What Does Code P0933 Mean? Unlike manual transmissions, which the driver manually selects gears, automatic transmissions shift gears by switching hydraulic circuits to engage and disengage different gearsets. In fully-automatic transmissions, this can occurs without any driver input other than the accelerator pedal. On the other hand, automated-manual, and some automatic and dual-clutch transmissions enable the driver to change gears via push-button without the need for a clutch. The hydraulic pressure is generated in the transmission pump and then distributed to the rest of the transmission via a series of valves, which can be both hydraulically and electronically controlled. 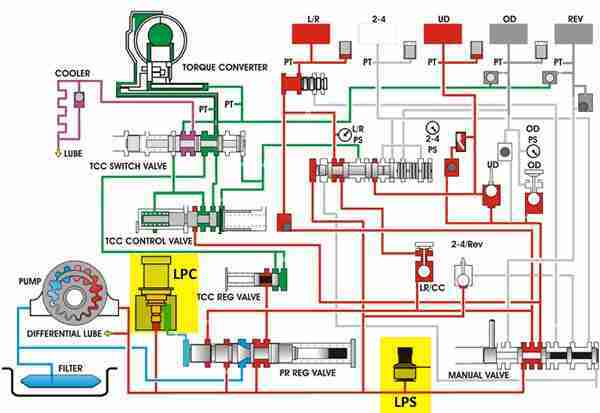 Electronically-controlled valves are modulated and monitored by the transmission control module (TCM), which may be integrated into the engine control module (ECM). Depending on driver demand and engine and transmission loading conditions, hydraulic pressure needs to be adjusted. For example, on light acceleration, one would expect the transmission to shift smoothly, perhaps imperceptibly. On the other hand, on hard acceleration, one would expect a firmer shift quality. In these two cases, pressure being lower or higher is automatically modulated by the hydraulic pressure control solenoid, also called the line pressure control valve. The ECM monitors hydraulic pressure via the line pressure sensor (LPS), making continual adjustments in line pressure control (LPC) solenoid duty cycle as needed to achieve the pressure needed for specific driving conditions. If the ECM detects a problem in the pressure sensor or the pressure sensor circuit, such as unexpected voltage, it will treat this as a fault and stop using the sensor for feedback. The ECM will store a diagnostic trouble code (DTC) in system memory and illuminate the malfunction indicator lamp (MIL). What are the common causes of code P0933 ? Depending on year, make, and model, DTC P0933 may have number of causes. Here are some of the most common. TSB – A few TSBs (technical service bulletins) have been released by various automakers to address this DTC. LPS and circuit problems notwithstanding, over-sensitive ECMs tend to reject the LPS readings as being off-spec. ECM updates were prescribed to address the issue, relaxing the specifications enough to ignore minor variations in signal voltage. Always check for TSBs when beginning diagnosis of a DTC. What are the symptoms of code P0933 ? How do you troubleshoot code P0933 ? To diagnose this circuit fault, you’ll need a DMM (digital multimeter) and EWD (electrical wiring diagram) specific to your vehicle. General Checks – Check wiring harnesses for obvious damage, which may indicate a short circuit. Check connectors for water entry or bent pins and that they are properly seated. Repair as necessary. Sensor Checks – Check for proper voltage and ground and repair as necessary. With the key in the ON position and using your DMM, you should measure LPS supply voltage at 5 V and 0 V to ground, with some variable voltage on the signal line. If you measure 5 V reference and 5 V ground, you have an open circuit to ground. Trace the ground circuit and repair it. If you measure 5 V reference and 0 V ground, but over 4.5 V signal, suspect an internal LPS short, but do not condemn the sensor until doing the final circuit checks. Disconnect the LPS. You should measure 5 V reference and 0 V signal and ground. If you measure over 5 V reference or over 0 V signal or ground, trace the circuit to find and repair the short to power. Circuit Checks – With the key OFF and the ECM and LPS disconnected, check the circuits end-to-end. You should measure 0 Ω end to end and over 10 kΩ to each other and to ground. If any measurements are off-specification, trace and repair the fault. None found. Ask a question about P0933. Muy buena información. Los felicito. Gracias por compartir.